*Unless the assumption that I made that B1048 is flying on PSN-6 is incorrect and NASA is ready to fly a booster on its third flight, which isn't impossible. 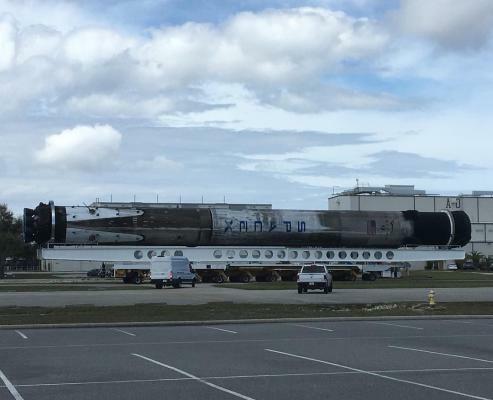 Falcon spotted enroute to Cape Canaveral, likely FH center stage. More than a little tenuous but this does look very much like a rectangular component in the right place to be FH-specific. It's definitely not a normal feature of F9 boosters in transport. 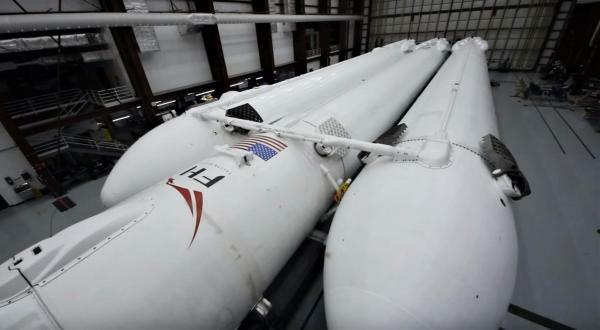 Elon has just stated B1048 will refly again in April. Also was a FCC filing for an unknown April launch with a high inclination from the Cape, so I'm going to guess it's for that mission. Maybe? Their environmental docs for the test said flat out it would be expendable, but SpaceX tends to change things. There are two boosters visible inside HIF in the new Crew Dragon video. I'm guessing they're the Arabsat sideboosters? From observations, I believe we can say for sure that at least one of them is a side core. The other could be a center (presumed) or side core. I would guess that all three are in the HIF based on the placement of the one closest to 1051 in the rollout video, but thats only a wild guess. A brilliant idea. Then let's have a look at the integration building at LC-39A. According to OSM and Google Maps, it's about 93-94 m long. 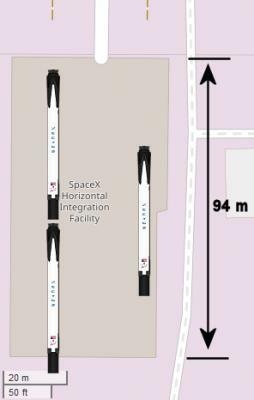 And if this is correct, a Falcon 9 v1.2 booster incl. interstage has a total length of ~ 47 m. (Afaik there was no substancial change with Block 5). 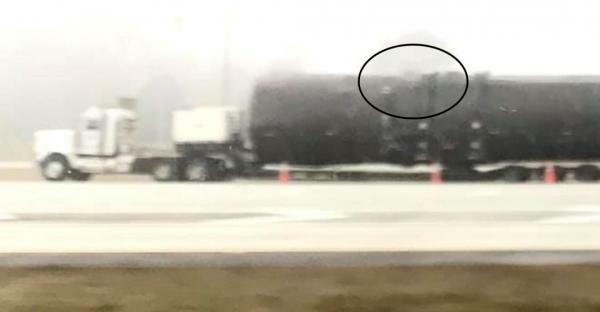 Now, from that video, I guess that there is ~ 5 m space in front of the booster to the left. Do the math, and you find out that - unfortunatly - there is not enough space to store a third booster in the back. Nah, I just mean 2 boosters on the left. Theres room in the HIF for 5 across if they want to do it, the TEL makes it very very tight. 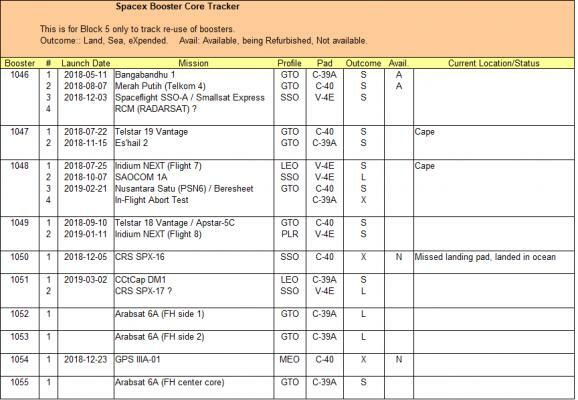 A while back a new thread was started "SpaceX Core Reuse Schedule" in Missions section which I thought was a great idea. The first post had a chart which I expected the thread's creator to keep up, but he didn't. I don't think it really belonged in the Missions section as it functionally duplicated info here. However I really like the idea of the first post being a chart and maintained so you can always go to one place to view current status. Two things, I have created a chart and would like your input both on what it shows and Current Status. and second, do you think it is worth starting a new thread? Or is this already being done somewhere, link please. Edit: Just to clarify, is somebody doing this on nasaspaceflight. I created that thread and I still keep an updated schedule, but didn't seem like there was enough interest to keep updating the thread. I will post an update tonight. I'm glad you found it useful. What does the A in the available column mean? I was planning on following Stephan.Christoff's design having A= Available, R= being Refurbished, N= Not available. Unless of course there are others here with a better suggestion.